The screen grabs of Map World. BEIJING - China has launched its official online mapping service, Map World, as Google Inc has yet to apply for a Web mapping license in the country. The State Bureau of Surveying and Mapping (SBSM) officially unveiled the free online map service on Thursday. The service will provide "comprehensive geological data", said Xu Deming, director of the SBSM, at the launch ceremony. Map World, the government-backed service, will "allow users to fly over mountains and plains around the world and search restaurants and traffic information across the country, free of charge", he said. 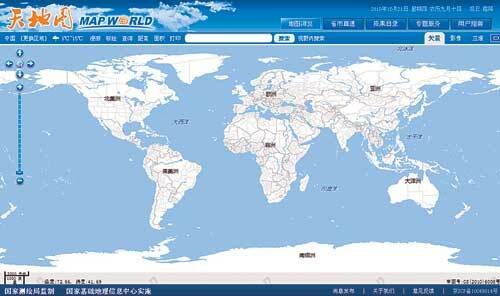 Users can enter Map World directly through www.tianditu.cn or www.chinaonmap.cn and search for two and three-dimensional images across the world, without client installations like Google Earth. The service features images of satellite remote sensing with a resolution of 500 meters but this is enhanced to 2.5 meters for the Chinese map and 0.6 meters for maps of more than 300 Chinese cities. "It took about two years to prepare the service with all the satellite images taken from 2006 to 2010," Jiang Jie, director of the database department of the National Geomatics Center under the SBSM, told China Daily on Thursday. But the technology and website construction are still at a preliminary stage. Service providers have more than 80 virtual machines to support the operation with the ability to handle 10 million requests daily, while Google Earth has thousands of virtual machines, Jiang said. "Our map service is expected to update the geological data about twice a year, but Google Earth can update its information every couple of minutes, through satellites," Jiang said. "In the near future, Map World will grow to be a famous Chinese brand for online map services with proven reliability," Xu Deming said. Regulations on updating data are still under discussion, Min Yiren, deputy director of the SBSM, said. "All the mapping information has been permitted by the SBSM and related national security departments," Min said. Restrictions on Internet mapping have been implemented in China to avoid disclosure of State secrets and block uncertified maps. The screen grabs of Google Map. The SBSM introduced a regulation in May that required companies providing online map and location services in China to apply for approval. To date, around 70 to 80 companies have applied and 31, including Nokia, Baidu, Alibaba, Sina and Tencent, have been granted licenses, Song Chaozhi, deputy director of the SBSM, told China Daily earlier. But Google China has not officially submitted an application, he said. 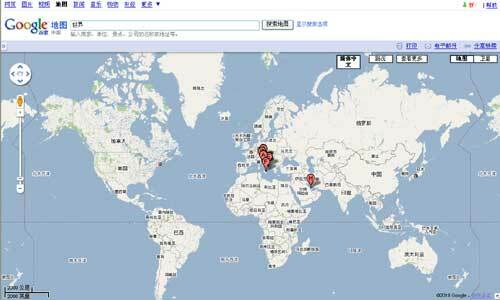 Qualified online map service providers are required to keep servers that store map data inside the Chinese mainland and must have no record of information leakage in any form over the past three years. The launch of Map World will "decrease the development and research cost" for providing commercial geological information "and regulate the Internet mapping market", Min said. Map World users gave positive feedback after trying the service on Thursday. One user in Beijing, surnamed Cui, told China Daily on Thursday that Map World can even locate the 7-Eleven, and Weiduomei, a well-known bakery, near her place of work. Wang Xing contributed to this story.